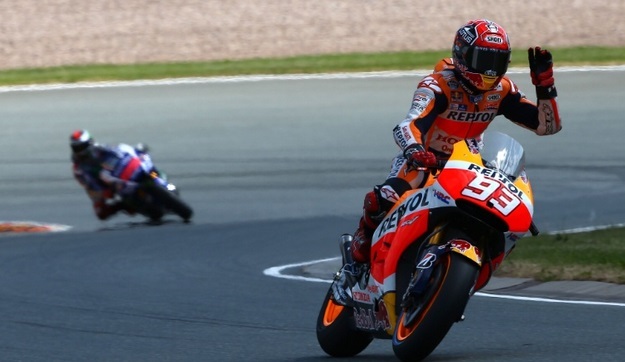 Marc Marquez has won the 2017 Germany MotoGP in Sunday having started in the pole position and with that win he moves top of the championship standings with 129 points thats 5 ahead of 2nd placed Vinales and 26 ahead of 5th place Pedrosa. Jonas FOLGER got a surprising second place on the podium. We move to the midway point of 2017 MotoGP season and German MotoGP will be taking place this weekend 30 June to 02 July 2017 at the Sachsenring circuit. With only 11 points separating the top 4 riders things are getting interesting as far as the riders championship is concerned. German MotoGP coverage starts on Friday, 30th June 2017 with the first two practice sessions followed by Saturday, 01 July qualifying round and the big race on Sunday, 02 July 2017. Currently Andrea DOVIZIOSO leads the championship with 115 points but Yamaha duo of Vinales and Valentino Rossi are second and third with 111 and 108 points respectively. 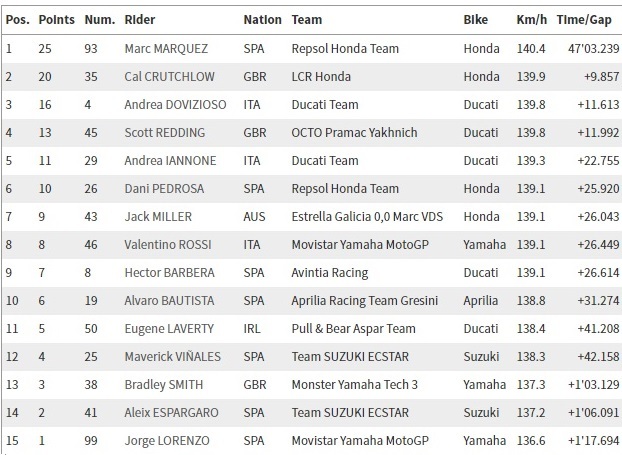 Marc MARQUEZ is fourth with 104 points and with such a small difference in points this race will be crucial as we had to summer break after that. Marquez has won all three grand prixs in germany in last three years and that too starting from pole and setting fastest lap records. Actually Marquez has won every race in Germany since 2010 and this pretty much is his domain. It will come as a bad news for the chasing pack of Lorenzo and Rossi. 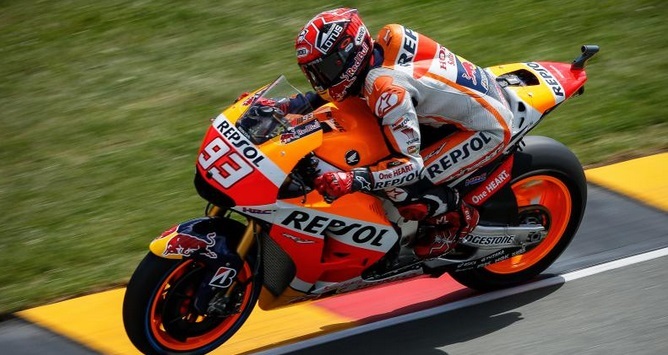 Another win in Germany will extent Marquez lead at the top and it all setup for a grand weekend of MotoGP action. Its a massive weekend as far as MotoGP title is concerned for this season. This will be the 9th round of 18th this season and after German Grand Prix we will have a summer break. A win for any of the top three will hand momentum on his hands when the season resume late in August 2016. 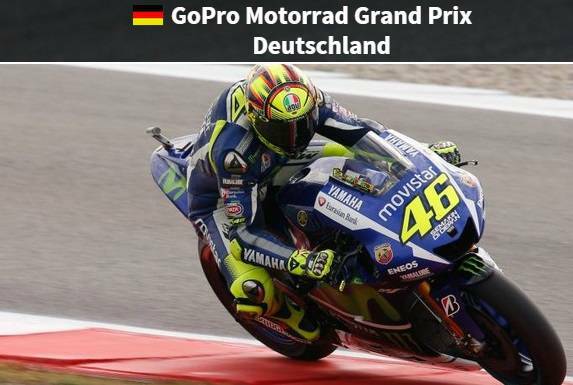 German MotoGP 2016 Qualifying and Race Results & Replays Like always we will be placing a full replay video of 2016 German MotoGP which will be available couple of hours after the race is over. The coverage will be from the BT Sports UK english and it will be available in two parts uploaded a few hours after the race is finished. You need to remember that video will only be available form next 24 hours after which it will be deleted. Once the race is over we will updated this page with the full race results, video highlights and reaction from the sundays big race. Valentino Rossi is leading the championship table but Jorge Lorenzo is on his tail and things are getting interesting between the two main championship rivals heading halfway through the season. 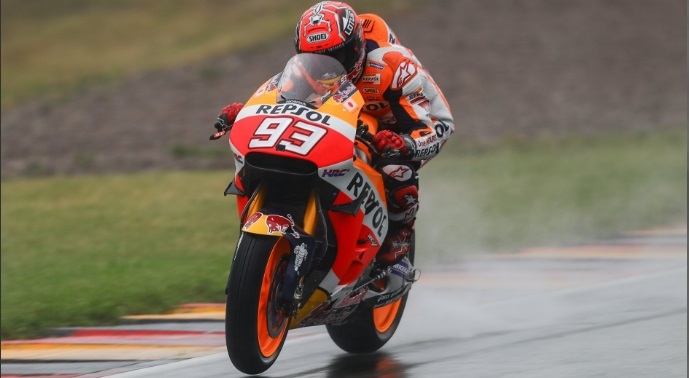 After rain soaked TT Assen grand prix, we had similar scenario before the start of Sunday’s German MotoGP where Valentino Rossi and Andea Dovizioso made superb starts but they failed to capitalized on good starts as Marquez continue his impressive run in Germany.